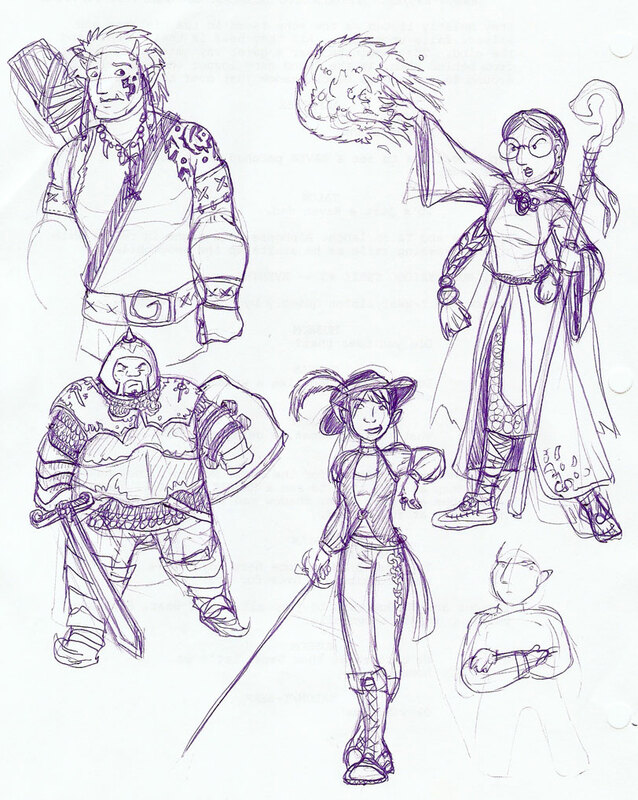 Looking back into the archives, the D&D game is one of the earliest ‘side’ storylines I ever did, second only to the Vampire LARP. This simple fact explains why these character designs are SO different than the characters we see now! Abbie was originally going to be a bit more of a swashbuckling sort of thief, which was more in keeping with her outgoing, slightly crazy personality. However, I later did a sketch (which I’ll have to see if I can find…) of her as a more ninja-like thief in homage to my buddy, who, if given his druthers, would play an elven ninja in any setting that allowed them, and a few that don’t. The look stuck. Dustin and Sarah didn’t change overly much, except that Dustin’s armor got a lot more streamlined and lost the helmet so that we could see more of his face. Mark’s is essentially the same too, except that I made him look a little less ‘tribal’, and gave him the fur-trimmed cloak that I always drew my barbarian character wearing, as I had moved cities and could no longer play him. Drawing Mark’s cloak always brings up fond memories of that game. And, if you’re wondering who that strange, half-finished grumpy guy in the lower right corner is… That’s Joel. I’d originally envisioned him as a depressed, sardonic halfling bard who would only sing in the most dire of circumstances. However, since I hate trying to write anything that rhymes, and the group needed someone ever-so-slightly malicious to run the game, that character got scrapped and Joel became the evil DM. I think he works *much* better in that role! I figured that was Joel. His ever present scowl gave him away. i like Abby’s design (that’s Abby, right?) but I think Raven could pull it off too. She could be a bard. Maybe. We had a late Christmas with my adult children, and one of them gave my wife and me the the commission piece you did of our WoD LARP characters. What a treat! One of the best Christmas presents I’ve ever received.